Take Your Kids or Grandkids on a Geocache Adventure in Knox And Cedar Counties! This map shows the highways to all the communities involved in the Shannon Trail. For those not familiar with the hobby, Geocaching is an outdoor game of Hide & Seek using hand held GPS-enabled devices. Participants navigate to a specific set of GPS coordinates and then attempt to find the geocache (container) hidden at that location. You can find more information about the hobby at www.geocaching.com. The special Pvt. Shannon Geocaching Trail, with 350 caches placed over the 180 mile route, will provide hours of enjoyment. As an added incentive to cachers, Knox and Cedar Counties contain approximately 650 caches in total. This allows the cachers to collect an additional 300 caches beyond those that are officially part of the Pvt. Shannon Geocaching Trail. My name is Mark Weber and I run GeocachersCompass.com. I recently saw your add in FTF Geocacher magazine and added your trail of caches to my site as a GeoTour or GeoTrail. Thank you for giving the caching community a great reason to enjoy your area! Who was Pvt. Shannon? Private George Shannon was the youngest member of the Lewis & Clark Corps of Discovery Expedition. On August 26, 1804, Shannon and George Drouillard were sent to round up the expedition’s strayed horses near present day Wynot, Nebraska Area . Drouillard returned the following day saying he couldn’t find the horses or Shannon. Shannon was lost! On September 11th, the keelboat crew spotted him on the shore, barely alive, after he had been lost for 16 days. See more of Shannon’s story in the Pvt. George Shannon Trail brochure and on the National Park Service Signs located at the 16 featured communities of the Shannon Trail or at shannontrail.com. Come enjoy northeast Nebraska and the adventures on the Pvt. Shannon Geocaching Trail and join us on Facebook and share your experiences along the trail. Collect prizes at the Corps Of Discovery Welcome Center on highway 81 south of Yankton, South Dakota. A number of people are having fun discovering northeast Nebraska along the Pvt.Shannon Trail. 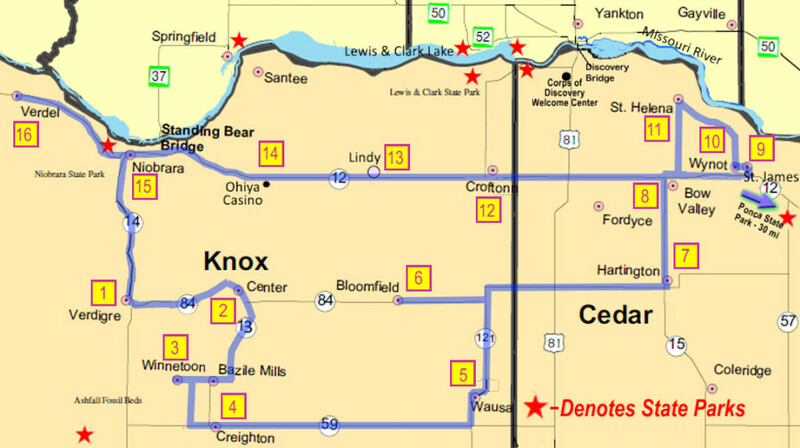 The trail, sponsored by the Shannon Trail Promoters Group, goes through the sixteen towns, villages, and tribal areas of the member communities. Grab your handheld GPS or smartphone and you can be on your way to a country caching adventure in no time at all. Along the route, there are many additional local features of interest that can be enjoyed including excellent eateries, lodging, fueling stops, individual Pvt. Shannon displays, National Parks historical signage, museums, state parks, local parks, local events, abundant wildlife, fishing, hunting, and many very friendly people. You can start a Pvt. Shannon Country adventure with geocaching fun on the Pvt. Shannon Trail. This is an opportunity for people of all ages to get outdoors and enjoy the beautiful hills and valleys of this trail as described in the Historic Pvt. George Shannon Trail brochure that is available at many locations throughout the area. Shannon Trail Caching is care free fun since there is no need to invest in days of planning or in loads of equipment for a caching adventure. Most of the trail caches are available with only a very short walk from your “caching-mobile” and are hidden under a variety of difficulties and terrains. You can plan a visit to the Pvt. Shannon Geocaching Trail with a quick visit to the internet (www.geocaching.com). The Pvt. Shannon Geocaching Trail extends over a 180 mile loop starting at Verdigre and traveling east to St. James before reversing directions to the west and returning through additional Highway 12 member communities. About 118 caches lie directly along the trail route with an additional 135 pre-established caches located just a short distance off the route. This makes available over 250 caches for the caching enthusiast. Since the Pvt. Shannon Geocaching Trail was released on May 22, many newcomers have visited our area for their own Geocaching adventure. To date, there have been nearly 1000 individual logs on these new locations by cachers from the plains. We have had visitors from multiple states including Nebraska, Iowa, South Dakota, Texas, Wisconsin, and Minnesota. Enjoy an outdoor experience on the Shannon Trail!